How about someone 5 foot, 10-inches tall? 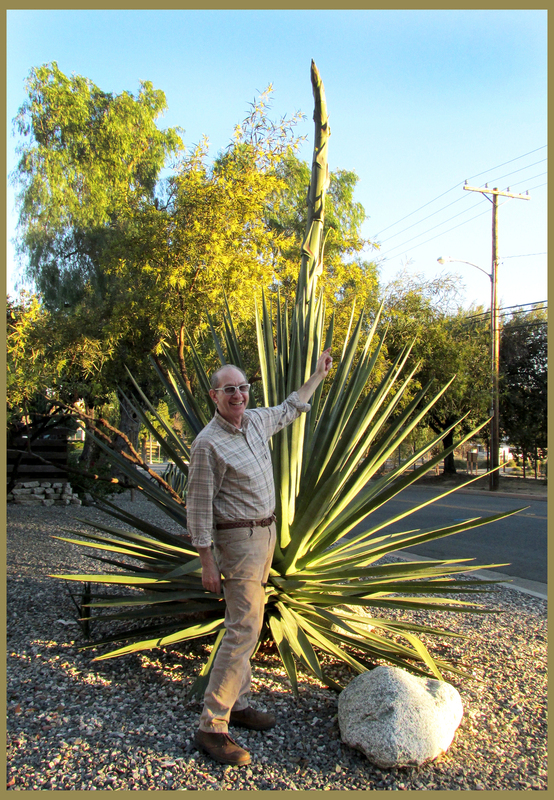 Paul, who is that exact height, graciously consented to stand next to our agave … it was his decision to bring a Vanna White-style zest to the proceedings. 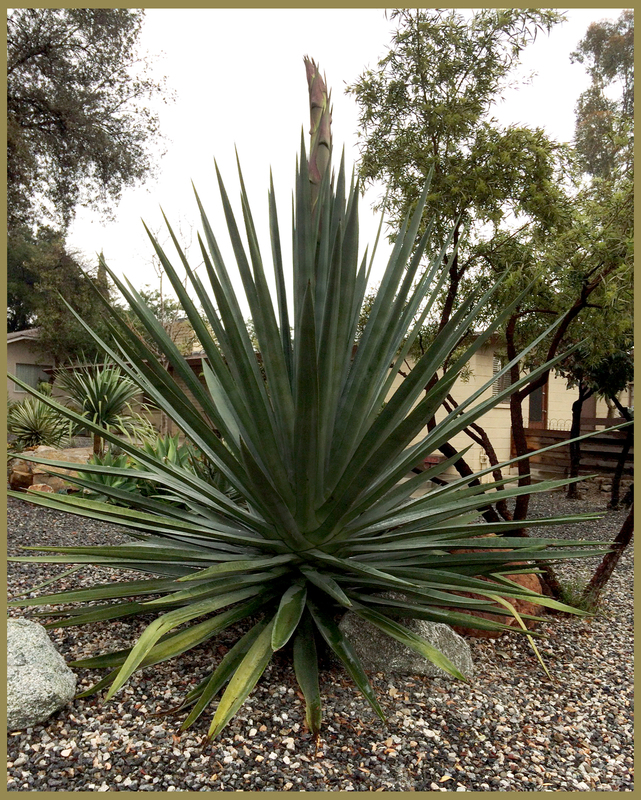 It’s been two weeks since that first photo; it’s easy to see that this agave must be over 10-feet tall, from base to stalk tip. But what height will it eventually reach? Your guess is as good as mine; I will be watching (and documenting) its progress. This plant is one of my absolute favorites. Its foliage looks like that of an ordinary shrub; touch the leaves, though, and you’ll experience the cool feel of a juicy-leaved succulent. I had no idea this plant would flower, and I had no idea it would flower so beautifully. The tight-lipped red-orange blossoms are a favorite of visiting hummingbirds and who can blame them? That’s a very appetizing shade of persimmon red. 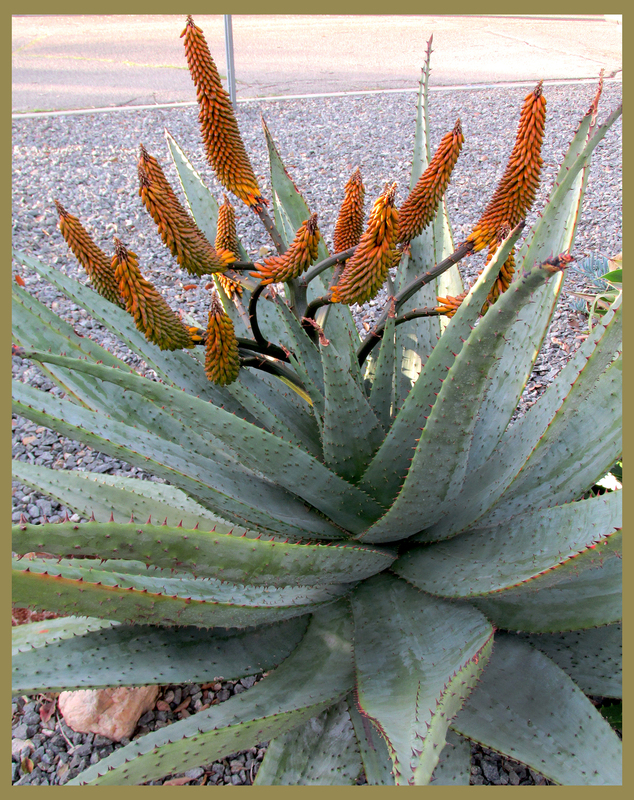 An all-time fave, this agave ferox has been providing me with much garden pleasure for years now … I fall in love with it each time it blooms. I guess I’m just partial to a fiery succulent torch song. Relatively new to our garden, this chubby little cactus does not play: It’s got long, curved rigid spines surrounded by sticky prickles. It was after the rains that what appeared to be dead blossoms became something else entirely. Used to the Rancho’s other cacti, with fruit in colors that range from deep purple to bright red, I happily welcome little yellow pineapple cactus fruit to my garden party! Given to me by another local propagator, this kalanchoe sends out long runners which end in little leafy clones of their base plant. I’m delighted by the idea that this plant will one day be overflowing its pot, crazy with little kalanchoe gifts I can bestow on visitors. When he gave me this plant he mentioned that it would flower, I just didn’t expect it to happen so soon. Check out the sweet little blooms at the top of the hanger’s curve. Getting to know local propagators is a good thing to do, whether they give you free plants or not. The local guys I know are always willing to share their time and knowledge, and when I’m looking to buy always give me great deals. It’s a humbling experience for me, however, since I can never remember the names of most plants, especially the latin ones! Wow–I love that hanging pot! Looking forward to seeing the ultimate height! My aeonium (unknown largeish type) is blooming but not as big as last year since it got cut off and stuck in a pot when we moved. Which is okay with me as it’s not my favorite succulent bloom, but I’ll take what I can get. Thanks, V! 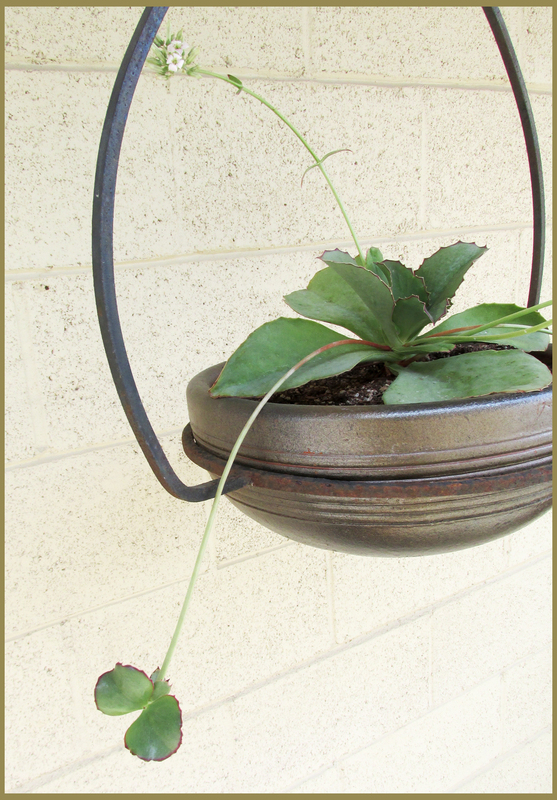 That hanging pot was brand new and terra cotta, I received it and the hanger as a gift. Never content to leave things as they are I painted the pot with 3 different spray paints from Rustoleum’s metallics line. I think it’s a better match now for the hanger which is a much older piece. So great! Was it unglazed? And if so, did you have to prime it first? My unglazed pots eventually begin to molt, but maybe that’s because I buy cheap ones? Hey, V … the pot was a basic unglazed terra cotta. The first of the paint coats was a grey metallic primer from Rustoleum. The following coats were a hammered metal looking paint in gray, with a top coat of a rust-colored paint. I could’ve easily gotten away with just two paints layered but I get a little nutty and want to add more. It’s a really nice fix for a basic pot and it sets off the aged classic metal hanger perfectly. Spring is a time that most plant lovers look forward to. All the new blooms just bursting with joy after months of being cooped up. 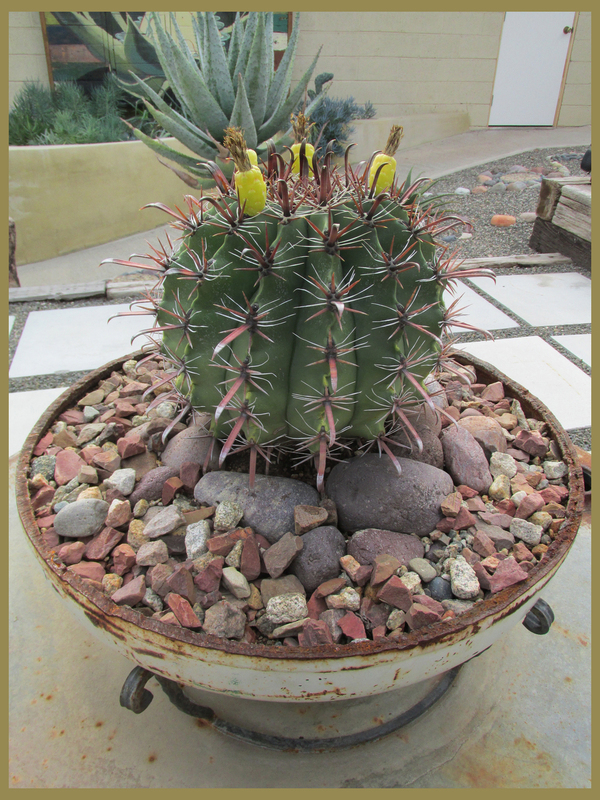 However, the blooms of cactus and succulents that occur this time of year, never cease to amaze and surprise me. They are so unique and bring such joy. 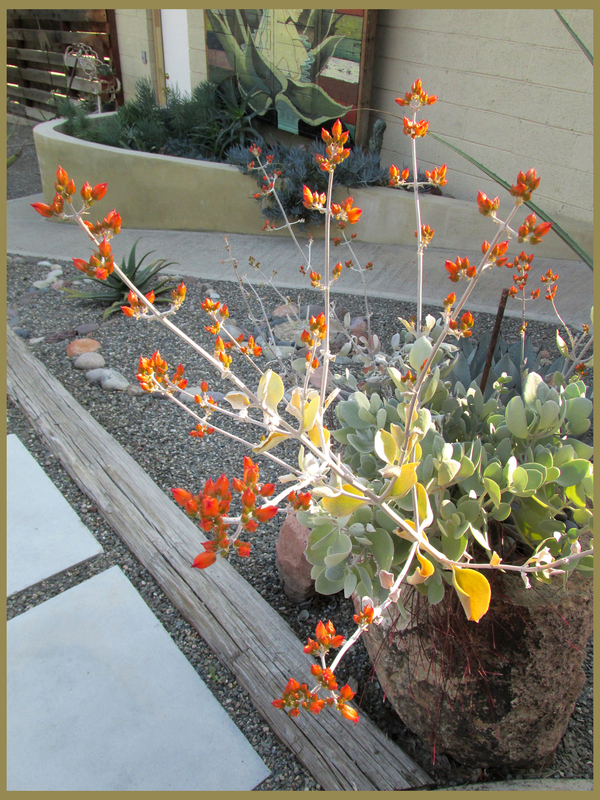 My favorite of your bunch is the Torch Bearer… I love the orange in the blossom and, the plant itself is so beautiful. I’m glad you’re taking photos of your large bloom because I’m curious to see if it actually flowers or just stays looking like an asparagus. BTW, tell Paul that I said he’s absolutely adorable. This photo of him made me chuckle this morning. Watch out Vanna, you have competition! Right, WF? Stick Paul into a sequined mini and a new career is born! I just checked the giant asparagus and it’s already got little branches detaching from its sides … won’t be long before it’s got a flowery crown with bees and hummingbirds attending them. Great photos, and while I enjoyed the flowers (and stalks and fruit) I was mostly taken by how perfect your garden is! Not a stone, weed, or leaf to distract from the geometric lines and design perfection. Color me jealous as I have a seasons worth of mess to clean up. Thanks, Loree! OCD helps a lot, not to mention many helping hands. Although we have no lawn we keep our gardener on; he blows debris weekly, does spot weeding and pruning when necessary, and keeps me from further injuring myself. How nice of Paul to be your stand in (no pun intended) for measurement. I think he would great in place of Vanna, even without the sequined mini. I love the plant just below the picture with Paul. Do you know it’s name? I wish I could send plants through the mail, because I have one that you would like. I’ll send a picture to you later. Can’t wait to see the Agave bloom. Darn it Val, I knew someone was going to ask me that very question. 😉 The grower who sold it to me told me the name of it; and when my chum Dustin Gimbel visited he said it, too; sadly I have no recollection of what either called it! Hopefully someone can help us out. Anybody? !